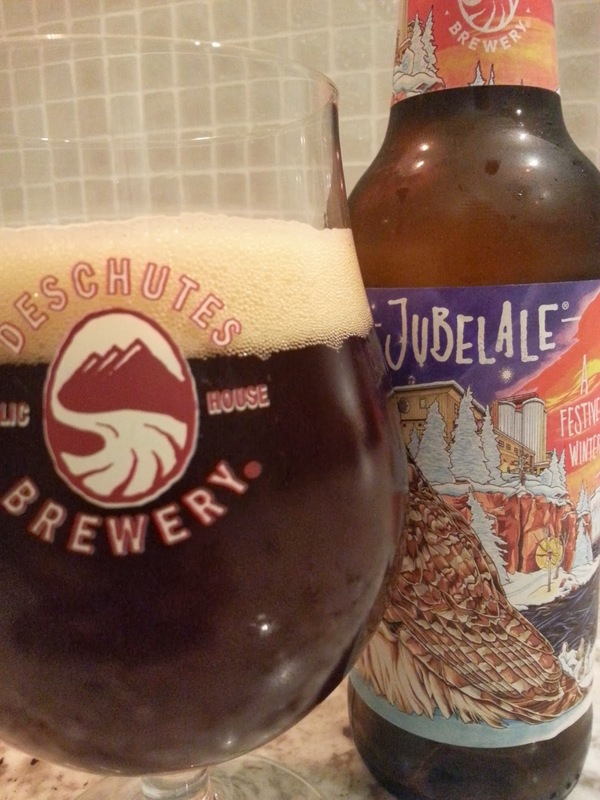 When it became obvious I was not going to post the twelfth beer by Christmas Day, I decided not to rush it. I actually went through a couple of different beers that I thought would be the final beer, but neither turned out to be very good, so I decided to pass on posting them. 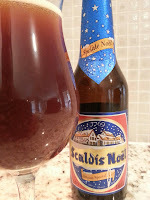 I finally decided on the little bottle of Scaldis de Noël that has been in the beer cellar since 2008. Brasserie Dubuisson was created in 1776 and is the oldest brewery in Wallonia, Belgium and is actually still in the same location. What is even more remarkable is that it is still a 100% independently owned brewery. For a five year old bottle of beer, there was still a good amount of life in this Belgian Strong Dark Ale as I poured it into the glass. A nice dark mahogany colour with a thin layer of carbonation. It was definitely time to drink it though, as there was visible particles floating around in the beer. However, they didn't affect the aroma or flavour. Molasses, caramel and dark fruits noticeable in the aroma. Flavour was similar but with more of the dark fruits like figs, raisins and dates coming through at the start. Those gave way to toffee and and a roasted malt sweetness before finishing light and surprisingly a little bitter. It also left a little residual tangy sweetness across my tongue. The 12% ABV was still enough to provide a noticeable warming affect. 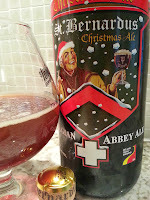 Although it was sometimes a little difficult to find the time during the holiday season to write the posts, I did enjoy creating this Twelve Beers of Christmas series and I'm glad I finally got around to doing it. Hopefully I can continue it next year with an all new round of holiday seasonals. Cheers! 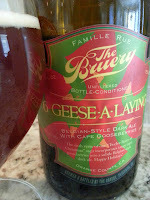 The fifth beer in the 12 Days of Christmas series from The Bruery. As indicated in the post for Beer Six a few days ago, the beers typically take their inspiration from their corresponding version, so 5 Golden Rings was brewed as a Belgian Golden Ale. Poured out a clear golden colour in the glass with a thin white head. Wonderful sweet aroma of golden fruits like pineapple, banana, pear and Belgian yeast. Juicy is one of the best ways to describe the flavour. Lots of pineapple, citrus and grape with notes of pear and grapefruit. Bready malts and caramel come through in the middle followed by cloves and allspice. Finish is semi-dry and slightly bitter. I think it could benefit from a little more carbonation as the mouthfeel is a little heavy and syrupy. The 11.5% ABV comes through in full force, giving a rather strong warming and almost burning affect. We'll see how this one ages and turns out in 2020. 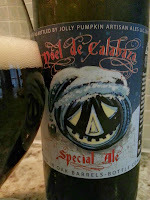 Jolly Pumpkin Artisan Ales was founded in 2004 and quickly gained notoriety for producing fantastic farmhouse ales using traditional methods. Fermented in open vessels with a variety of French and Belgian yeasts, the beer is then aged in oak casks for months where it undergoes a secondary fermentation with wild yeasts in the barrels. After aging, the beer is bottled with additional yeast and left to bottle condition (develop further flavours and carbonation in the bottle). All of that fermenting and aging results in beers with complex and unique flavour profiles. The Noel de Calabaza is the first and only farmhouse or sour beer on the Twelve Beers of Christmas list. Not because I don't like them, but because I don't think I have any others. 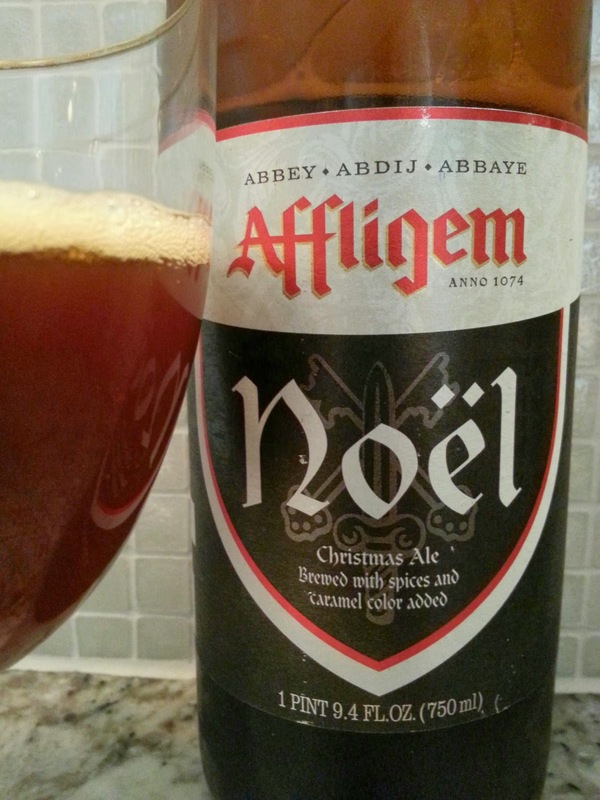 The aroma is surprisingly light, but the smell from the wild yeasts definitely let you know that this is not a traditional Belgian dark Christmas ale. If you can get past the funky yeast smell, you can also get hints of oak and dark fruits in the aroma. Although the flavour is predominantly tart and funky from start to finish, it's not overpowering. If you take the time, you can get a lot of different flavours out of this beer. Dark fruits like raisins, figs and plums with maybe some green apple, grapes and sour cherries. Some of the oak even starts coming through in the dry and tart finish. The alcohol is 9% ABV, but it really doesn't even come in to play. This was definitely a great change of pace from the traditional sweet and spicy Christmas beers and I savoured it down to the last drop. 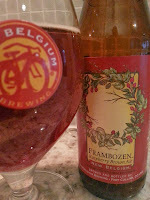 Flemish for raspberry, Frambozen has been brewed by New Belgium since 1993. Only fresh raspberries from the Pacific Northwest are used and because of that, the amount produced will vary based on the amount of raspberries that are available that year. Back in 2006, a very poor raspberry crop limited the amount they could produce and Texas was one of only a few select markets that received any that year. If you're not a fan of raspberries, then this is definitely not the beer for you. The aroma and flavour is filled with the smell and taste of ripe, tart raspberries. Even the colour is a ruby-tinted light brown with a light pink head. However, there is still a good amount of malts that break through with a hint of nuttiness and a little bitter chocolate that helps to balance it out and remind you this is still a brown ale. It's a little sweet up front, but that gives way to a finish that is slightly dry and tart but not mouth puckering. Some of the toasted malts even come back in the lingering raspberry tartness. This is another beer that I've aged (sometimes accidentally as bottles get shoved to the back and forgotten) and it typically holds up well. The raspberry tartness becomes even more intense as other flavours start to drop away, but I would recommend drinking it fresh and often while it's still available. 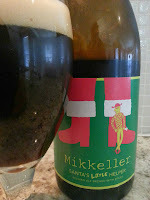 Mikkeller was founded by homebrewers Mikkel Bjergsø and Kristian Keller in 2006 in Copenhagen, Denmark, but Kristian exited the company in 2007. Mikkel is referred to as a gypsy brewer as he does not own a brewery, but instead uses the brewing and bottling facilities of various other breweries. Even though this seems like it would be a limitation for a brewer, Mikkel has apparently brewed over 600 different beers (according to their Wikipedia page). 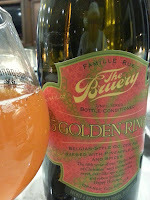 Mikkel's brother Jeppe is also a gypsy brewer who founded rival brewery Evil Twin Brewing in 2010. After the disappointing non-Christmas Christmas Ale that was Beer Four, Santa's Little Helper gets us back on track. It's a Belgian Strong Ale that poured almost completely black with a fluffy tan head. Roasted malts, brown sugar and dark chocolate in the aroma with a hint of the alcohol hiding inside. Sweet caramel and roasted malt flavours up front with slight tastes of licorice and molasses coming out as the beer warms. A slightly bitter finish followed by a lingering flavour of roasted coffee and bitter chocolate. As the beer continued to warm, I also started to get a hint of cayenne pepper at the back of my tongue and throat. Perhaps that's the spices referred to by the "brewed with spices" on the label. The 10.9% ABV is a little noticeable with a gentle burn as it goes down providing a nice warming glow. I have another bottle of this that I think I'll age for a few years as I think it will probably mellow out the flavours and tone down the alcohol. 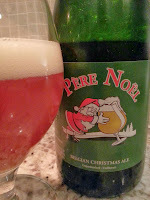 Santa Claus hugging a snifter of beer on the label with the word's "Belgian Christmas Ale" underneath are the only things that makes this a Christmas beer. 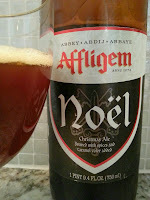 There is nothing in the aroma or flavour that gives it the typical characteristics expected of a Belgian Christmas Ale. The brewery's own website even indicates "...very different from any other Christmas ales you might know". They're not kidding. I contemplated not bothering to include it as part of my Twelve Beers, but since I'm a little behind on my posts due to taking a trip back to my Canadian homeland, I'll go ahead and keep it as number four. It's actually a pretty good Strong Belgian Pale Ale and I'd be more enthused about drinking it if that's all that I was expecting. Usual aromas of lemon and bananas with a hint of white pepper and cloves. Light pale and sweet caramel malt flavours to start along with some of the same spiciness found in the aroma. Finishes very dry with a grassy hop bitterness. 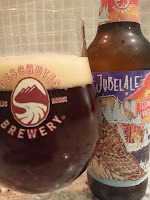 A decent beer, but again, certainly not one that I could classify as a Christmas Ale. On to number five! 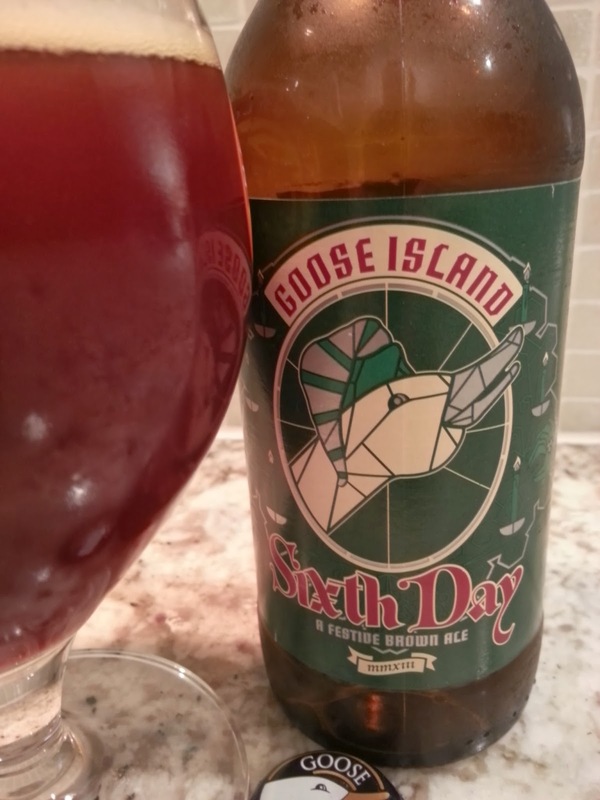 Goose Island has only recently started distributing to Texas, so this is holiday beer that I haven't had before. According to the website, they "change the recipe slightly so that you have something special to look forward to" which is what Anchor Steam has been doing with their holiday seasonal since 1976. I was surprised that it was labeled as a Brown Ale (albeit a Festive one) based on the colour in the glass and I had to let it warm up quite a bit before more characteristics of a brown ale began to emerge. 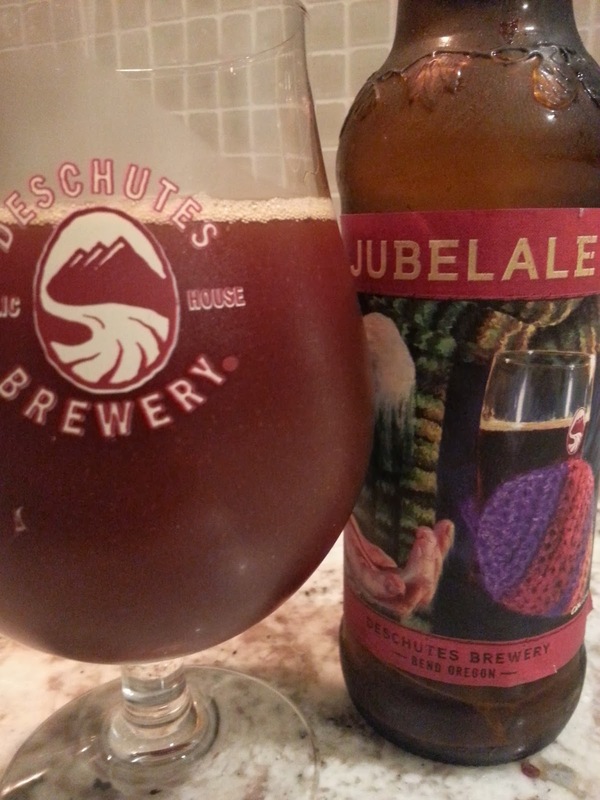 Aromas of sweet malts, red licorice with a slight scent of herbal hops. Flavours of molasses and fruity esters to start which then gives way to hints of bitter chocolate in the finish. The alcohol content is 8.3% which left a bit of burn going down. But there was also an odd stringent bitterness that carried through from start to finish that dominated too much for me to enjoy it. The Bottled On date shows Sept 13 which is not that long ago, but I've tasted that same flavour in other brown ales that have been sitting around too long. A little disappointed in this one, but perhaps it's better when fresh. 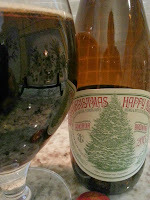 This is one of my all-time favourite holiday beers, so it's no surprise that I started with it. However, this is a bottle from 2010 that has been resting comfortably in my beer cellar for the past three years. 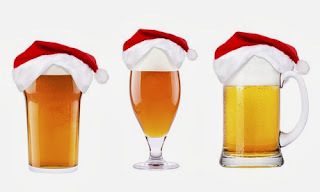 Holiday beers often have higher ABV and sometimes include strong flavours of spices, fruits and sugars and a little extra time can help to calm things down and balance it out. I also just enjoy seeing how beers change as they age. There was still plenty of carbonation when I popped the corked and the head dissipated down to a thin layer of bubbles in the glass. It has such a wonderful aroma of dark fruits, sweet malts and holiday spices that are also carried over into the flavour. 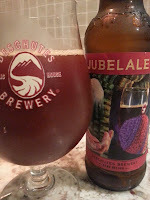 It tastes of plums, dates, and apricots with sweet caramel malts along with a hint of cinnamon and nutmeg in the finish. All that combined with the bready flavours from the St. Bernardus house yeast and its like a slice of my Mother's Christmas cake in a glass. And although it's a hefty 10% ABV, the past few years in the cellar have helped to take the edge off and give it a smooth and creamy mouthfeel. Walk down the beer aisle at your grocery store or beer store and you'll notice the shelves, the floor and all other available space is now filled with stacks of holiday beers. My beer cellar, fridges and pantry are usually overflowing at this time of year as well (much to my wife's dismay) as I pick up bottles of my usual holiday favourites and any new ones that I've yet to try. With all this beer around me, I've wanted to do some sort of Christmas beer series for the past few years and I'm finally getting around to it. Although I'm calling it the Twelve Beers of Christmas (I know, not exactly original) I may certainly surpass that number of posts based on the number of holiday beers on the market right now. Perhaps next year I'll change it to a Beer Advent Calendar which would give me twenty-four, but I'm getting ahead of myself as I haven't even managed to complete the first of what will hopefully be at least twelve posts before Christmas Day. Anyway, my plan is to showcase my favourites as well as some of the new ones to the Houston market. Feel free to list your own favourite holiday beers in the comments. And if you're really feeling the holiday spirit (I'm sure there's some sort of pun in there), you can always send me a few of your favourites. Cheers! The Ginger Man in Houston is hosting its annual Christmas Beer Tasting on Saturday, December 7th at 3:00pm. Tickets are $40 per person and available now. Sadly, I will be out of town that weekend, but I have enjoyed a few of their previous ones. Based on my past experiences, a taxi or designated driver is most likely necessary as holiday beers are typically quite high in ABV. Sonoma in the Heights did a great job with hosting their first beer dinner featuring beer from Independence Brewing on Wednesday night. It was an intimate gathering on their rooftop patio and although it was open to the elements, the large fireplace kept the area warm and the rain managed to stay away until the dinner was over. Bootlegger Brown was served to guests upon arrival before serving the first course of red snapper ceviche paired with White Rabbit. The zesty citrus flavors of the Belgian Wit were light enough to compliment the delicate flavors of the fish without overpowering it. The second course was a cheddar cheese soup with caramelized onions and Andouille sausage served with a pesto crostini. Austin Amber was paired with it and quite frankly, I think the best pairing of the evening. The caramel malts added to the richness of the soup and enhanced the caramelized onions. Slightly sweet malt flavors go well with meaty pork dishes and hoppy bitterness often amplifies saltiness, so Stash IPA was the perfect beer to pair with their pork loin wrapped in applewood smoked bacon. A hoppy bitter finish also helps to clear the palate when eating dishes with fat such as bacon and creamy sauces. The pork loin is actually a regular item on their menu and I highly recommend it. After the large portions that we had already received, I was glad to see that the final course was not a heavy and sweet dessert. Instead, the Convict Hill Stout was served with small portions of cheeses and chocolates. Chocolates are a natural pairing with a big oatmeal stout like this one, but I had never tried it with cheeses. The Barely Buzzed is an espresso hand-rubbed cheese that was absolutely delicious and went well with the roasted malt flavors. Thanks to Sonoma for hosting and looking forward to going back there and trying some of there other regular offerings. Well, it's short notice, but if you live in The Woodlands, then this may still work for you. 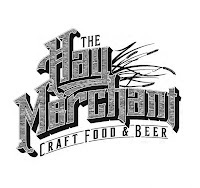 The Baker Street Pub & Grill in The Woodlands is hosting a Beer Dinner tonight at 7:00pm. 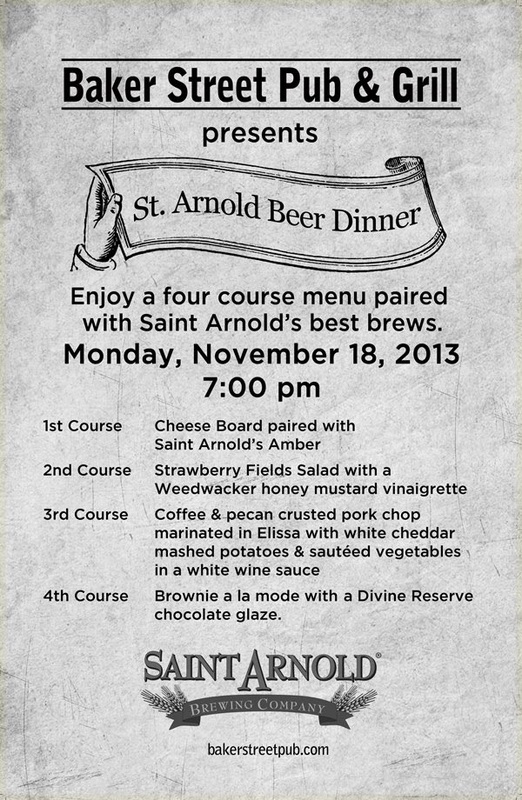 It's a 4 course dinner paired with 4 different beers from Saint Arnold for only $30. Rumour has it that they'll also have multiple releases of Bishops Barrel on hand. Call Serena at 281-362-7431 for more details. Sonoma Wine Bar in The Heights is hosting a Beer Dinner featuring beers from Independence Brewing on Wednesday, November 20th. 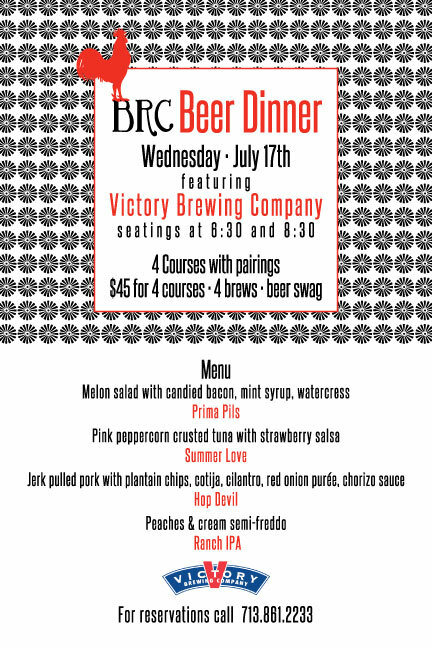 Dinner includes three courses plus a reception beer and desert. Tickets are $45 per person (plus tax and tip) and seating is limited. Contact Sonoma to make reservations at (713) 526-9463. There's an all new mobile app available for the Great American Beer Festival (GABF) this year and it already appears to be significantly better then the one released last year. An interactive map of the convention floor displays the locations of the brewery booths and allows you to add breweries to a “My Breweries” list which also marks them on the map, making it easy to remember and find the breweries you want to sample. And as you visit and sample, you can check off the breweries, makes notes and rate the beers you try. The beers being poured will be released on Oct 9th and its strongly suggested you update the app via WiFi before attending the festival (trust me, you definitely want to update before as the cellular reception and mobile data speeds is terrible in the convention center once the festival gets in full swing). The app is available for download now from Google Play and Apple iTunes. 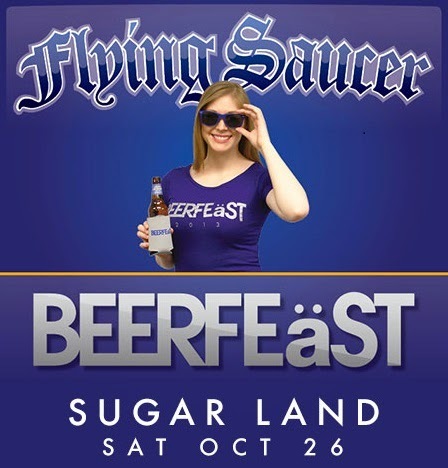 The Sugar Land Flying Saucer's 2nd annual BeerFeast takes place under the big tent on the Sugar Land City Hall Plaza on Saturday, October 26th from 1pm ~ 7pm. Over 40 breweries will be represented pouring over 60 different beers plus rare and limited edition beers will be tapped throughout the day. General Admission tickets are $30 and available for purchase online or at the Saucer and will increase to $40 the day of the event. 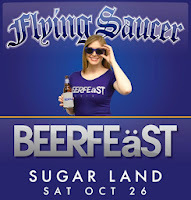 Tickets include a tasting card good for 12 samples and BeerFeast tasting glass. Additional tasting cards can be purchased for $5 each. There is also a designated driver option for $15 which allows your non-drinking friend to tag along with you and get free soft drinks. I think anyone who's interested in craft beer (at least, for more than just the past couple of years) knows who Michael Jackson is. And if you don't, for shame! An English journalist and author of many books on beer (and whiskey), he is widely credited with being responsible for generating the worldwide interest in craft beer. Michael Jackson's The World Guide To Beer was first published in 1977 and inspired many beer drinkers to reach beyond their domestic macro lagers for more flavorful and interesting brews. The beers featured in his book were categorized into style groups based on local customs and names which later became the basis of the beer styles still used today to categorize and judge beers. In 1990, Michael hosted a British TV show called The Beer Hunter in which he traveled to different countries to showcase their beer culture. Unfortunately, despite its popularity, it was not renewed for any additional seasons, but Michael continued to be known around the world as The Beer Hunter. 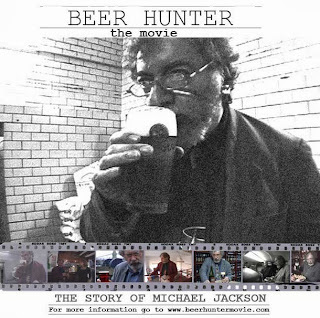 Beer Hunter - The Movie is comprised mainly of footage shot during 2004 by a film crew following Michael to various countries for tastings, speaking engagements, beer dinners and simply enjoying a few pints at his favourite local. Its then finished with follow-up interviews shot last year with many of the people featured in the original footage. 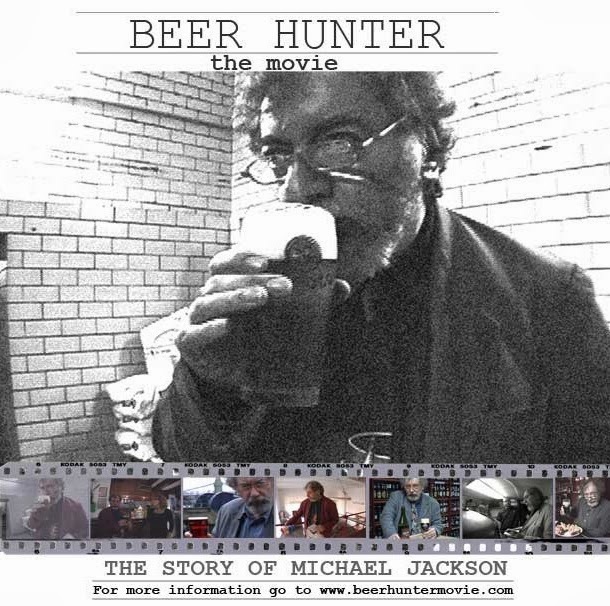 Its not so much a documentary of Michael Jackson's life, but more of a snapshot of what it was like to be the most well known and influential person in craft beer. Unfortunately, Michael passed away in 2007 at the age of 65 after suffering from Parkinson's disease in secret for over a decade, but his impact on craft beer will continue indefinitely. The DVD is available for order online for $20. Watching a bartender incorrectly blending the beers together while trying to pour a Half and Half was the inspiration for the Dual Beer Glass from glassblower, and founder of the Pretentious Beer Glass Company, Mathew Cummings. The individual chambers of this hand blown glass keep two beers separated until the drinker takes a sip. At that point, I'm not sure if the two beers will then get combined in the glass anyway, or if the twisted design of the interior wall keeps them from spilling over into the other chamber. There is also the added bonus of being able to see the colour and smell the aroma of the individual beers which is typically lost when blending beers. Due to the nature of handmade glassware, the dimensions will very slightly but the glasses are approximately 5~6" tall, 3" wide and hold 10~12 oz. I'll admit, I am curious about them, but at $35 each (or 4 for $125), I'm not sure if I'm curious enough. 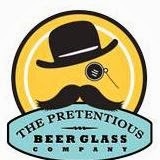 The Pretentious Beer Glass Company also produces a variety of other pretty cool hand blown glassware that's designed specifically for craft beer. You can order these and see all the other glassware on their order page. Brewuniversity is now in session at Central Market and their hosting a variety of beer related events over the next few weeks including hands-on cooking classes, demonstrations and beer dinners where you can learn how to incorporate beer into recipes, enjoy meals paired with local craft beers or simply learn more about craft beer in general. The Sip & Stroll takes place on Thursday, September 12th from 5:00pm ~ 8:00pm ($10 w/ commemorative beer glass) and allows you to casually work your way through stations spread throughout the store. Stop and sample the unique beer and food pairing at each station and learn more about why they were paired together. •Cherries of Fire Ice Cream Sandwiches. •Winter Warmer of Spiced Pumpkin & Cranberry Muffins served with Winter Strong Ale. For more information about these and other classes and to make reservations, please see the Central Market Houston Cooking School website. 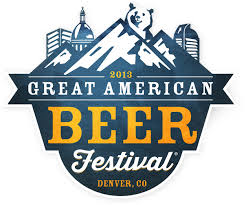 The brewery registration for the 2013 Great American Beer Festival filled up in under 2 hours, leaving many well known and past winning breweries locked out from being able to register. A wait list quickly grew and although a lot of those breweries were eventually offered spots on the convention floor to pour their beer, they weren't necessarily able to enter any beer for the competition, leaving them to decide if it was still worth it for them to attend. For people who have attended past GABF tasting sessions, booths for some big name breweries may be noticeably missing this year. It will be interesting to see what changes will be made for the registration process next year since the number of craft breweries is only continuing to increase. There are currently 652 attending breweries listed on the GABF website (as of August 1st), but it does not specifically indicate if all of them will be in the convention hall. Good luck to all breweries who have beer entered in the competition this year and I look forward to sampling it on the convention floor. Show you support Texas craft beer by buying and wearing this awesome T-shirt featuring the logo of 50 members of the Texas Craft Brewers Guild. The T-shirt is available for order online in a variety of sizes from Outhouse Designs. 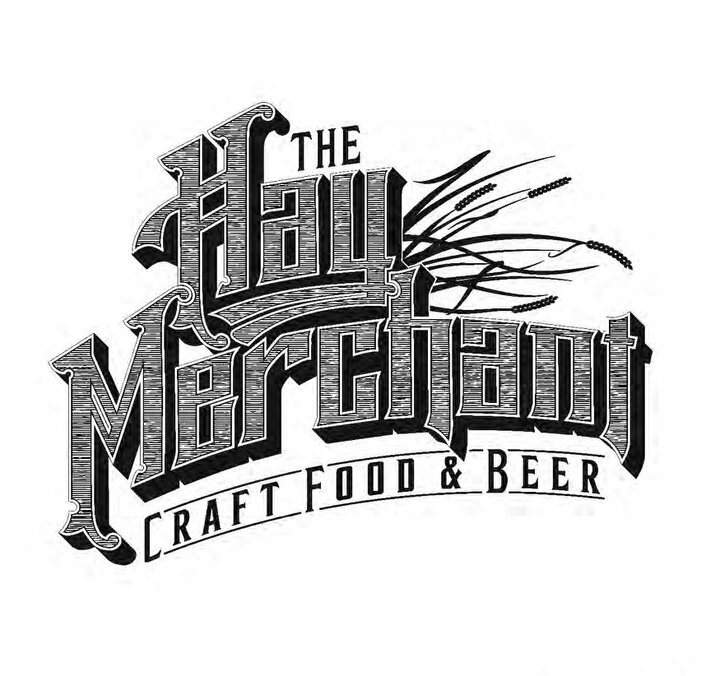 They will also be available for purchase at the Texas Craft Brewers Festival next month and hopefully soon at various breweries around the state. In honor of Belgian Independence Day (July 21), The Ginger Man is hosting their annual Belgian Beer Tasting on Saturday, July 20th at 3:00pm. 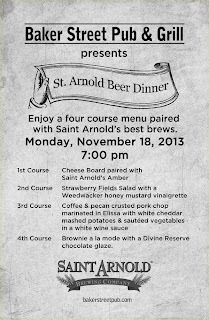 Tickets are $40 per person (including tip), but seating is limited, so call 713-526-2770 to make your reservations. 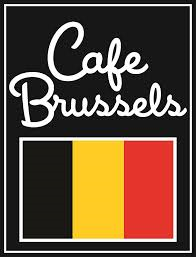 I've attended a couple of these in the past and always had a great time, but keep in mind that most Belgian beers are quite strong, so pace yourself. Watson's House of Ales is hosting their first annual Brew Fest on Saturday, July 20th from noon to 6:00pm. Although a post on their Facebook page firmly declares "Houston ONLY brews! 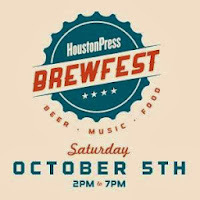 ", they apparently mean the very greater Houston area as the list of attending breweries not only includes Saint Arnold, Karbach, Buffalo Bayou and 8th Wonder, but also Lone Pint (Magnolia), Southern Star (Conroe), Fort Bend (Missouri City) and No Label (Katy). It looks like a great opportunity to taste and compare beers from all the local breweries in one spot and the Watson's Facebook page hints at special casks from No Label and Karbach. Festival attendees will also get to vote for their favorite brewery and the winner will get a tap at Watson’s and be featured for a happy hour. 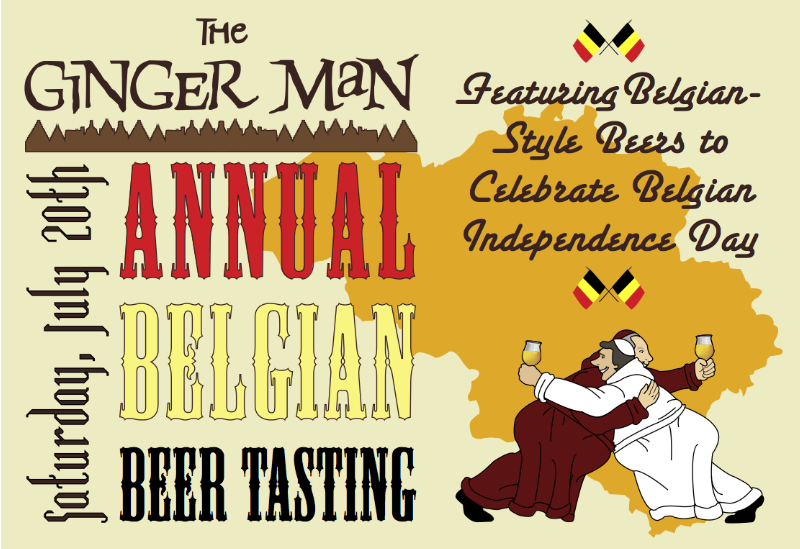 Tickets are $25 for 16 samples and are available for purchase at the pub. There are two seating times for dinner (6:30 p.m. and 8:30 p.m.) and the cost is $45 per person (plus tax and tip). 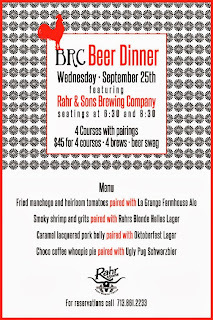 Call BRC at (713) 861-2233 to make your reservation,. 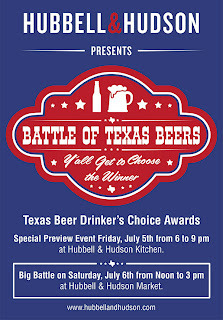 Hubbell & Hudson in The Woodlands will be hosting a Battle of Texas Beers this Friday, July 5th and Saturday, July 6th. Everyone who votes in the "Texas Beer Drinker's Choice Awards" will be entered for a chance to win prizes, including a special Hubbell & Hudson Viking Cooking School hands-on cooking class featuring local brews. A special preview event takes place at the Hubbell & Hudson Kitchen (located at 4526 Research Forest Drive) on Friday from 6:00pm to 9:00pm with live music and a chance to sample some of the breweries before the Battle of Texas Beers which takes place on Saturday from noon to 3:00pm at the Hubbell & Hudson Market (located at 24 Waterway Avenue). I've been to a few past events at Hubbell & Hudson and they have a great beer selection in their walk-through cooler and I always find some great cheeses and other delectable food items to pair with them. Definitely a worth a visit. I had never heard of the Draftmark tap system until I was contacted by them recently to see if I was interested in receiving one to try. 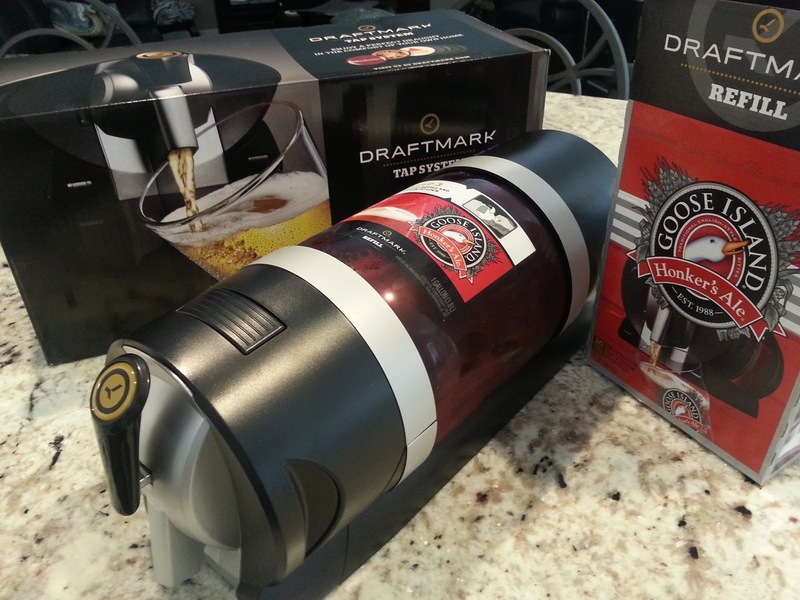 For those who are also unfamiliar with it, the Draftmark is a new easy to use self-contained in-home draft beer system from Anheuser-Busch InBev. Dispensing beer from a disposable 1 gallon bottle without the use of CO2, the Draftmark easily fits on the shelf in your fridge in about the same space as a 12 pack of cans. Its actually small enough and light enough that you could take it with you to a party, camping, etc. An insulated carrying bag with freezer pack around the bottle would actually be a pretty good add-on for it. The main system itself retails for around $49.99 with the beer refills ranging in price from $13.99 ~ $15.99. I haven't actually seen the system or refills in the Houston area yet, but the Spec's website indicates limited availability at their various locations. The setup is very simple but does require about 4 ~ 6 hours to charge the removable battery and may take that long to chill the beer refill, so don't expect to be pulling your first pint as soon as you get the system home. The Draftmark is designed to be extremely low maintenance as there is no CO2 bottle to change or lines to clean. The rechargeable battery powers an air pump that automatically pumps air into the space between the bottle and the liner that contains the beer to essentially squeeze the beer out (no air comes in contact with the beer inside the bottle). Each beer refill includes a new spout used to dispense the beer from the bottle, so there is nothing that needs to be cleaned when changing refills. The one gallon of beer will get you about eight 16oz pints. At this time, the refills available are Budweiser, Shock Top, Goose Island India Pale Ale, Goose Island Honker’s Ale, Michelob AmberBock and Bass Pale Ale. The detailed setup instructions indicate that the first pint could be foamy (which it was), but my subsequent pours have been as well (despite trying different pouring techniques). The foam does settle quickly, but the beer itself seemed less carbonated. I'd have to try a couple of more refills to know if that's normal for this system or not. As this is a product from Anheuser-Busch InBev, the selection of beer refills is limited to their own products. I have to admit, I probably wouldn't have been interested in trying it if they didn't have Goose Island refills available. At around $16 for the Honkers Ale refill, that's about $2 per 16oz pint (a pretty good price for draft beer) or $1.45 per 12oz serving (which would be about $8.70 per six pack of bottles). Its not necessarily saving you money, but I do enjoy the ability to pour as much or as little as I want. Overall, I thinks its a pretty cool self-contained system, but the limited availability of craft beer refills will keep it more of a novelty that I'll bring out for parties and get-togethers. I like Goose Island, but not enough to always have one of them on tap in my fridge and that's the only current refills I'm interested in. Considering you can buy a 18 pack of Budweiser cans for less then 20 bucks, I'm not sure it will really appeal to the average Bud drinker either. I think they need to expand the refill selection to include more of their premium and import brands like Hoegaarden, Leffe and Stella, as the consumer of those brands is more likely to spend the money on this type of system and continue to use it. Somehow getting actual craft breweries on board, even if it was just the larger ones like New Belgium, Sierra Nevada or Sam Adams would be great as well, but probably unlikely. In the meantime, I'll happily finish my Honker's Ale and I'll probably try the Goose Island IPA when I find it here. I was in there on Saturday for lunch and they had already started clearing out taps in order to make room to put all this beer on for the celebration.